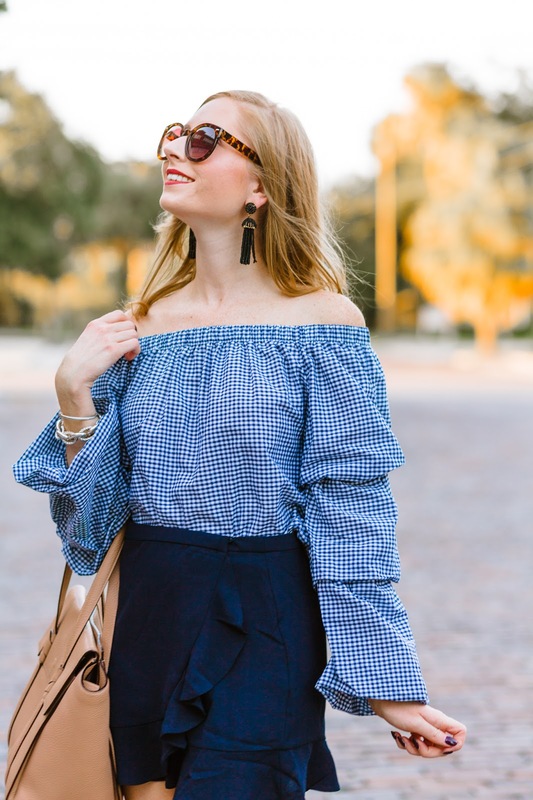 TOP: Charlotte Russe Gingham Off-the-Shoulder Top (Just $9.99!) 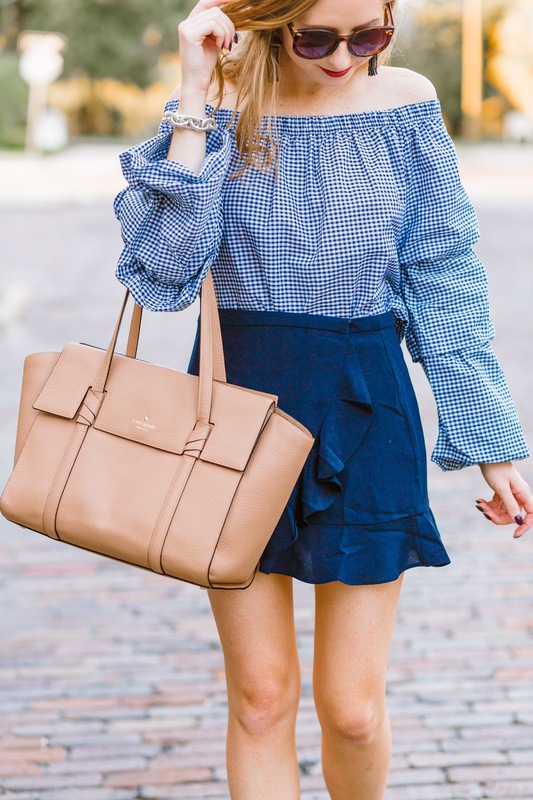 | |Ruffled Gingham Top | J.Crew $20 Ruffle One Shoulder Top || SKIRT: Forever 21 Mini Skirt ($17.90) || SUNNIES: Karen Walker "Crazy Tortoise Shell" "Super Duper Strength" || BAG: Kate Spade New York Daniels Drive Abigail Leather Satchel || EARRINGS: BaubleBar Mini Pinata Tassel Earrings || LIPSTICK: Smashbox Always On Liquid Lipstick in "Driver's Seat"
While browsing on my blog, it's no surprise to discover that my favorite color is blue. I wear it SO much that sometimes I need to give it a rest, but that is not the case with this look today. Bring on the shades of blue! 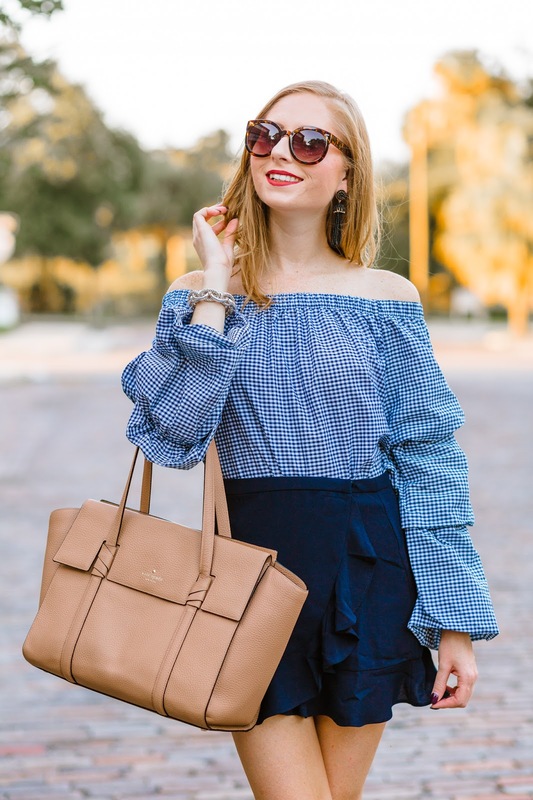 The gingham trend was clearly a favorite of mine during the summer months, and I've figured out a way to blend it into my fall wardrobe. 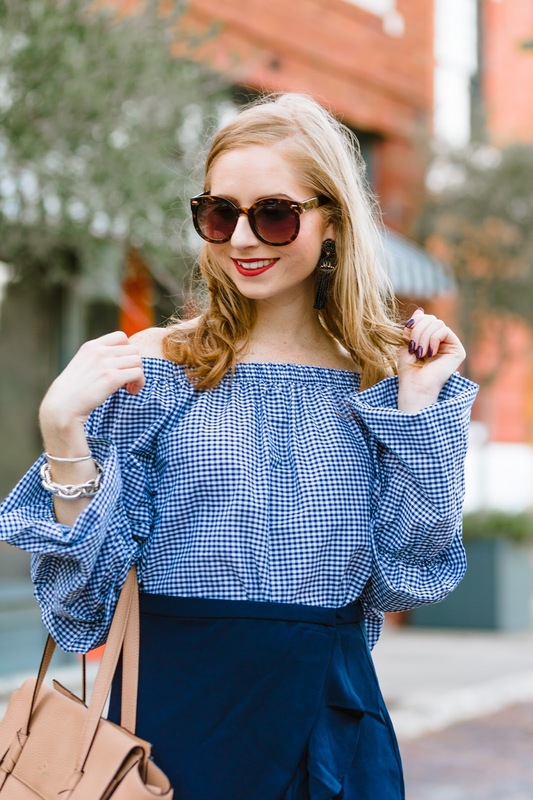 Purchasing this GINGHAM OFF THE SHOULDER top from Charlotte Russe inspired me to find a way to incorporate the pattern during November (which by the way, happens to be 85 degrees outside right now! How annoying). The ruffled sleeves are amazing, too. And for under $10.00, if you haven't tested out this trend for yourself yet, you won't be breaking the bank with THIS TOP. Tassel earrings are another fall essential. When the weather cools down, there is nothing better than throwing on a cozy jacket and letting my accessories do the styling! BaubleBar has a lot of color options for you to choose from when it comes to fun tassel earrings, and this BLACK PAIR is a great staple to own for mixing and matching. Thank you for visiting the blog today.